Most orders on Tyneside can be delivered within 48 hours, sometimes sooner. Further afield, it will depend on when we have a delivery round, but it’s rarely more than a few days. We supply Flying Firkin wholesalers. We are a member of the SIBA Beerflex Scheme for direct ordering through their member pubs and pub companies. We are on Trade Simple for ordering by Stonegate/ The Beer Company pubs in our area. 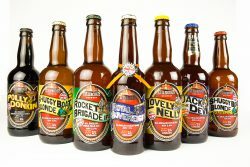 You can buy bottle conditioned beers at Boda Home 74 Whitley Road, Whitley Bay and at Fenwick in Newcastle. Also Centrale in Newcastle Central Station. We don’t sell to supermarkets, in spite of repeated requests, as they won’t pay enough to make any margin at all! The beers are hand bottled and labelled, matured for several weeks to enable secondary fermentation in the bottle – this ensures a lovely creamy head when poured – no filtering and fizzing with CO2 here! It also achieves a much deeper character and flavour, and a natural, soft carbonation, unlike 90% of of ordinary bottled beers, which have forced carbonation producing a sterile, rather than a living, product. Because our beer is an artisan, small batch product, we can only supply a few outlets, the range varies, but we do try hard to keep up with demand. If you can’t get it you’ll just have to go to the pub! 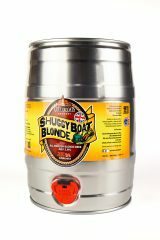 We do produce 5 litre ‘party kegs’ ( also keg conditioned with live yeast) at Christmas, on sale at Boda and Fenwick by end of November each year.